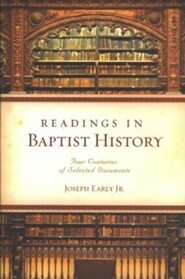 In all, it contains key information concerning the theology, origins, conflicts, denominational organization, and historical events of early English Baptists, American Colonial Baptists, Southern Baptists, American Baptists, the Baptist Missionary Association, European Baptists, Baptist Bible Fellowship, the Cooperative Baptist Fellowship, and much more. The book also profiles influential pastors, theologians, missionaries, and Baptist leaders. Joe Early, Jr. is assistant professor of Religion at the University of the Cumberlands in Williamsburg, Kentucky. He holds degrees from Cumberland College (B.S. ), Midwestern Baptist Theological Seminary (M.Div. ), and Southwestern Baptist Theological Seminary (Ph.D.). Readings in Baptist History compiles four centuries of notable religious documents, from John Smyths "The Character of the Beast" in 1609 all the way to the 2000 revision of the Southern Baptist Conventions "Baptist Faith and Message." This primary source Baptist history book can be used as a companion to larger history texts or stand strongly on its own. Almost thirty years have passed since Dr. H. L. McBeth wrote his Baptist History Sourcebook. Much has happened in Baptist life since this publication. The Southern Baptist Convention has adopted a new Baptist Faith and Message, the Cooperative Baptist Fellowship has come into existence, the Baptist Missionary Association has adopted a new confession of faith, and there has been a resurgence in Calvinism. These events serve only to highlight the many changes over these thirty years. 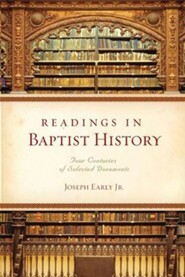 This book chronicles all these events as well as many others and attempts to preserve the most influential events and occurrences throughout the Baptist denomination's four hundred year existence. 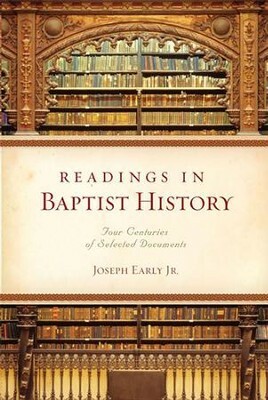 The writings of important Baptists such as John Smyth, Thomas Helwys, Roger Williams, Isaac Backus, George Lisle, Richard Furman, George W. Truett, Elias C. Morris, John Clifford, Charles Haddon Spurgeon, Lottie Moon, and many other documents from prominent Baptists have been included so that readers may arrive at their own conclusions as to the intention of the writers. Important documents recounting leading events in Baptist history such as the birth of the Triennial Convention, Southern Baptist Convention, and Cooperative Baptist Fellowship are also included. This book includes many of the problems that have encompassed Baptist life such as slavery, various schisms, and doctrinal differences. Important documents relating to such groups as the American Baptists, Russian Baptists, Baptist Missionary Association, Fundamentalist Baptists, Southern Baptists, Cooperative Fellowship Baptists, Black Baptists, British Baptists and Landmark Baptists are included in this book. Thus, the book could form the basic research document for many students that involve the broad spectrum of Baptist history. The manuscript could be used in church training classes or for personal study. This book is a valuable resource for anyone who wants to know more about the broad group of Christians who call themselves Baptist. I'm the author/artist and I want to review Readings in Baptist History: Four Centuries of Selected Documents - eBook.